May buy 1 for yourself and unlimited as gifts. May redeem 1 voucher per purchaser per order. Voucher must be redeemed within 3 months of purchase date to activate subscription. Voucher valid for 1-year membership to Magic School Bus Science Club and includes 1 science kit a month for 12 months. Each kit has multiple experiments. Vouchers redeemed by November 30th, will be included in the December 2nd mailing, vouchers redeemed by December 13th will be included in the December 14th mailing. Entire voucher value must be used in a single order. Once voucher is redeemed, there are no returns, refunds, or cancellations. Standard shipping is included; international shipping is not available. Expires 3 months after purchase. See the terms that apply to all deals. 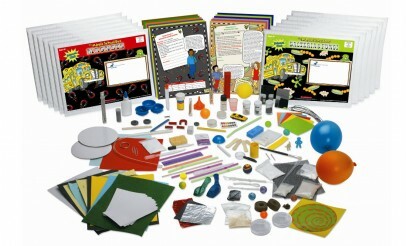 Monthly experiment kits feature characters from the acclaimed TV series: The Magic School Bus. Kits are delivered right to your door each month with shipping included. Suitable for kids ages 5-12. Also included is an e-newsletter, access to an online clubhouse, and a certificate of completion. You can even surprise your young scientist with a customizable gift card to announce the future arrivals of these great science kits. The Young Scientists Club's goal is to provide children with high-quality, science-related products that will fascinate them and spark their interest in future scientific endeavors. Designed by Harvard graduates, scientists, educators, and parents, The Young Scientists Club's products are made to combine fun, hands-on activities with quality and learning in each and every product.